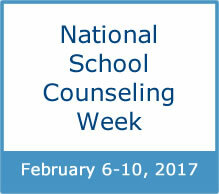 Did you know this week is National School Counseling Week? The American School Counselor Association (ASCA) sponsors the week to bring attention to the unique contributions of professional school counselors in schools across the country—as well as to highlight how students benefit from the work that school counselors do. National School Counseling Week celebrates the impact school counselors can have in helping students achieve school success and plan for a career. and work with teachers and other educators to provide an educational system where students can realize their potential and set healthy, realistic, and optimistic aspirations for themselves. Visit GetMyFuture.org for CareerOneStop’s collection of online tools and resources to help young people explore careers, learn about education options, and search for jobs. This website just for youth includes an Interest Assessment, Occupation Profile, and Scholarship Finder, among other resources. Check out the Video Library to find hundreds of career videos to share with students interested in exploring their career options (more than 100 of the career videos are newly revised). Find Outreach Materials such as posters and brochures to share with parents and youth. Thanks, school counselors, for all you do!